Is it Kobe beef or Wagyu cattle? Kobe Beef vs Wagyu cattle: What is this stuff, anyways? Kobe Beef is a legendary delicacy of Japan, a type of beef that is so well marbled that it goes right off the charts for Prime grading in any other country. The meat ends up looking like it has been left out in the snow because of the intensiveness of the white fat marbling, rivals foie gras for richness and caloric content, and costs an obscene amount, often $300 a pound or more for the real thing from Japan. I have been exhaustively researching the topic of Kobe Beef in the hopes of purchasing one of those legendary cattle for about a year, since I had heard that they were ranched successfully in the United States for sale to a hungry Japanese market. I finally succeeded, but it wasn't an easy task. Here's why. Let's start with the basicsKobe beef comes from a breed of cattle called Wagyu. In order to earn the designation/appellation of "Kobe Beef", the Wagyu beef must come from Kobe, Japan, and meet rigid production standards imposed in that prefecture. However, land and grain are expensive in Japan. So what is happening is that the beef production houses in Kobe have been contracting out to other producers to custom raise their cattle for them. Most specifically, Harris Ranch in California, among other producers in America and Australialand and grain is cheap over there, and it's worth the shipping costs to have the cattle raised overseas. So they have the cattle raised to their exactingly specified Kobe standards, and they actually fabricate the carcasses in Kobe, making them legally "Kobe Beef" even though the cattle were actually born, bred and fed somewhere else. The "Wagyu beef" designation can legally be applied to the meat from any cattle of the Wagyu breed; it's a genetic thing, not a place appellation or a reference to how the cattle were raised and fed. This breed is genetically predisposed to intense marbling, and produces a higher percentage of oleaginous, unsaturated fat than any other breed of cattle known in the world. The reason for this is that Japan has been selectively breeding for marbling grade for centuries, while cattle ranchers in America relied on external conformation until just a few decades ago. Even today, carcass evaluation is a relatively new step in show judging, and only beginning to be a factor in the professional stud books of other countries. Okay, why is it so bloody expensive and hard to find? In summary, Wagyu cattle are astounding in yield grade and marbling, significantly superior in this respect to any other known breed. So why aren't more farmers ranching them in America? Simple. Not enough of a market. The massive supermarket chains (Safeway, Lucky, FoodsCo, etc) carry Select grade beef which has minimal marbling. They restructured and lowered the grading of beef itself at one point (I think in the 1940's, but I could be mistaken on this) to reflect a more conservation conscious economy, because cattle fed out to a lower ratio of marbling were a more efficient return on resources. So today's Select grade beef (which is below Prime and below Choice) is lean indeed, the equivalent of pre-war Good grade. 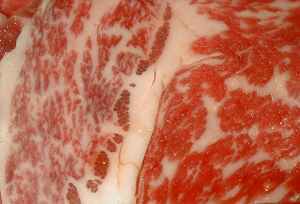 While Wagyu beef has healthier fat (if there is such a thing!) and less waste backfat that American breeds, lean and skinny it is not, and the market for high prime beef is very limited in America. It's fit to mass market only in Japan, so there it all goes, even if it's largely ranched elsewhere these days. Annoyingly, when we in America want to purchase Wagyu, we have one of two options: we can buy it shipped back over from Japan at some insane cost per pound that includes two transoceanic fares, or we can try to track down an independent Wagyu rancher who will sell one carcass. This is harder than you think. Me: "I understand you ranch Wagyu cattle. I'd like to buy some." Rancher: <frown> "Ahh, well, yes we do. But who told you that?" Me: "I did some research. Will you sell me some?" Rancher: <harder frown> "Minimum order is 500 head. We do custom feeding programs only for major customers. I can't help you." Me: "Oh, so you're selling to Japan, then." Rancher: <still harder frown> "Well, yes." Me: "Sigh. That's all I needed to know." Scenario repeated several times in several places with minimal variation. Try it yourself and see, and email me if you find anyone who will actually talk to you. Japan has a very tight monopoly on Wagyu beef, whether on purpose or simply because most large custom ranching operations do not want to sell one cow to the home consumer. I am still not quite sure what was going on behind the scenes here, but I did get a distinctly chilly reception from basically every major Wagyu contractor I tracked down as being a large scale shipper of cattle to Japan. Interesting, no? Could be just a coincidence and I managed to catch a lot of ranchers having a bad hair day, but who knows. So, what's the big deal about this beef anyways? What does it taste like? How does Wagyu beef taste? If it's cooked wrong, lousy. Bland. Not too flavorful. Kind of boring. If you cook it right? Awesome. Beef foie gras. Smooth, velvety, incomparably sweet with a subtle tang of savor that lingers on the palate like a rare perfume. It's a Japanese thang, I guess, and a Westerner used to eating a huge plate of aged beef (which is also something I adore) might not be able to fully appreciate the subtlety of Wagyu. And true Kobe beef? Overrated. At ten times the price because the cow was raised on expensive land eating expensive Japanese grain and beer, the quality is not noticeably better than ordinary Wagyu beef that grades out to super-prime. About those legendary cow massages? It's in part because they don't have enough room to exercise in a normal paddock. American and Australian raised Wagyu cattle that get the oleaginous feed and a well designed exercise program grade out just fine, and I doubt even the most discerning palate could tell the difference if the grade was the same. Anyhow, I hate to say this, but it's a waste for the average consumer to buy Wagyu beef and try to cook it at home without special instructions. If you care enough to buy the stuff in the first place, research how to cook it before you lay out the doughit is markedly different from anything you will have handled before, and I mean markedly. Its physical structure, texture and cooking times do not resemble beef so much as foie gras, except that it doesn't poach nearly as well and responds better to searing. How do I cook Wagyu if I actually buy some? Open flames, preheated cast iron and Wagyu beef are friends. Good friends. A quick sear of thin pieces in a very hot flame works wonders, and if you are lucky enough to have a thick steak, you want it absolutely seared and crispy on the outside and raw and quivering on the inside, even if you do not normally eat your steak this way. You can use an intensely preheated cast iron pan or grill to achieve this effect, but you cannot allow the steak to remain in contact with heat for long enough to melt all the fat and cause it to drip out of the internal structures of the meat, or you will end up with boringly tough, dry, expensive meat. Wagyu is a fragile creature under heat. Treat it delicately and with the utmost care, and it will reward you with velvety perfection. Another good analogy to cooking Wagyu is that of a baked Alaskayou need to sear the outside, but if you let it sit under the heat too long, it will melt the ice cream inside, and you will have an unappetizing mess. The physical structure of Wagyu beef is not unlike ice cream in that it can literally melt and change into something very different from its ideal form. Wagyu sashimi, or thin raw strips of beef marinated in a bit of soy sauce, dashi broth and green onion, is very popular in Japan. If tartare is not to your taste, place the thin strips on top of a very hot bowl of rice briefly, and the heat will cook it perfectly. Which is to say, very slightly. "Well done" and "Wagyu" are not words that go well together. "Gourmandise is an impassioned, rational and habitual preference for all objects that flatter the sense of taste." What's the other red meat? Try Avion. Beef with feathers? You better believe it. All the rich, sizzling flavor of a thick juicy steak, fewer calories than skinned chicken. If you can find some, don't miss this delicacy. Are you a Conscious Carnivore? Find out by reading this essay on the origins of the meat we eat.